St. Anthony, gentlest of Saints, your love for God and charity for his creatures, made you worthy, when on earth, to possess miraculous powers. Miracles waited on your word, which you were ready to speak for those in trouble or anxiety. Encouraged by this thought, I ask you to obtain for me the favors that I seek —mention your request here). His feast day is June 13. There is perhaps no more loved and admired saint in the Catholic Church than Saint Anthony of Padua, a Doctor of the Church. Though his work was in Italy, he was born in Portugal. He first joined the Augustinian Order and then left it and joined the Franciscan Order in 1221, when he was 26 years old. The reason he became a Franciscan was because of the death of the five Franciscan protomartyrs -- St. Bernard, St. Peter, St. Otho, St. Accursius, and St. Adjutus -- who shed their blood for the Catholic Faith in the year 1220, in Morocco, in North Africa, and whose headless and mutilated bodies had been brought to St. Anthony's monastery on their way back for burial. 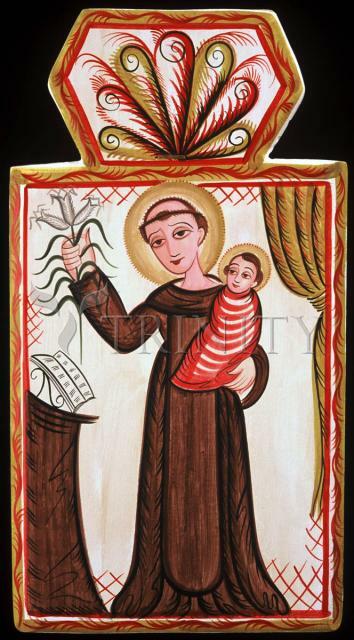 St. Anthony became a Franciscan in the hope of shedding his own blood and becoming a martyr. He lived only ten years after joining the Franciscan Order. So simple and resounding was his teaching of the Catholic Faith, so that the most unlettered and innocent might understand it, that he was made a Doctor of the Church by Pope Pius XII in 1946. Saint Anthony was only 36 years old when he died. He is called the hammer of the Heretics. His great protection against their lies and deceits in the matter of Christian doctrine was to utter, simply and innocently, the Holy Name of Mary. When St. Anthony of Padua found he was preaching the true Gospel of the Catholic Church to heretics who would not listen to him, he then went out and preached it to the fishes. This was not, as liberals and naturalists are trying to say, for the instruction of the fishes, but rather for the glory of God, the delight of the angels, and the easing of his own heart. St. Anthony wanted to profess the Catholic Faith with his mind and his heart, at every moment. He is typically depicted with a book and the Infant Child Jesus, to whom He miraculously appeared, and is commonly referred to today as the "finder of lost articles." Upon exhumation, some 336 years after his death, his body was found to be corrupted, yet his tongue was totally incorrupt, so perfect were the teachings that had been formed upon it.